Life itself is not easy and it is often hard to juggle life’s everyday challenges let alone create a well-defined financial plan for you and your family. That is why we pride ourselves on structure to help overcome these challenges. We do this by incorporating the principles of People, Process, and Strategy. Our team has over 35+ years of investment experience and has the ability to utilize the expansive resources available at LPL Financial. We then incorporate our detailed fact finding process to determine all the pertinent information about their individual situation and needs to enable us to create the proper scenario to help them pursue their monetary goals. In short, our clients are our mission. We are committed to helping clients invest and preserve wisely by providing independent financial insights, a full spectrum of traditional and non-traditional products and responsive client service. Our goal is that our clients understand their financial position, have confidence in their investment decisions and feel optimistic about the future. Listen to our clients and understand what they expect to achieve for their short or long term goals. Decipher income and growth needs. Discuss and set expectations for risk and volatility. Create a highly detailed and personalized financial plan. Select proper portfolio managers catered to the proper asset allocation model for each client's particular situation. Make any necessary changes based upon clients' request. Set expectations for face-to-face reviews on account. Invest according to agreed plan agreed. Set up direct deposits/automatic withdrawals and client online access. Constantly review and monitor clients account based on their goals and current events. 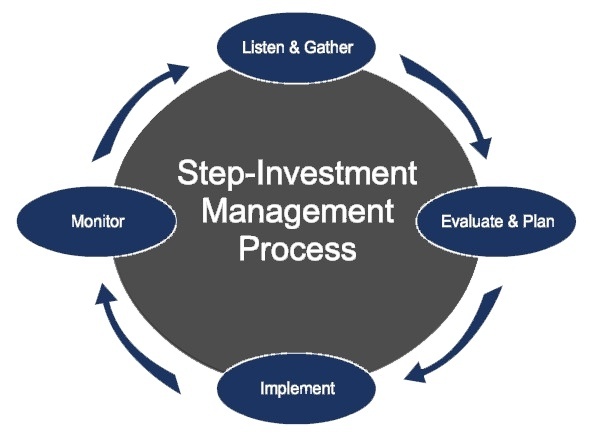 Evaluate portfolio manager selection and performance. Rebalance portfolios to stay in line with proper asset allocation.